Health Care Reform has arrived. Yet there are still a lot of questions. Changes and updates come to us nearly every day. DON’T MAKE THE WRONG CHOICE. Please call us before you do anything with your current coverage, and we can help advise you on your best course of action. Some of the provisions took effect immediately, some in September 2010, and others spread out all the way until 2015. Of course October 1st 2013 is the start of enrollment for Individual Guaranteed Issue and Healthcare exchange policies. Here in California the Exchange or Marketplace as they now call it is called Covered California. Our office is attending training and will be certified to sell and advise you on all your options including Covered California. Plans will have to make changes in benefits, including “well care” benefits, to stay eligible for tax deductions and credits. You can “freeze” or “grandfather” a plan but no benefit changes, additions, or deletions may occur. Some say that “Grandfathered” or existing plans may actually become less expensive than new plans as they do not require some of these benefits. Time will tell. Insurance companies will be prohibited from canceling coverage except in cases of fraud. Lifetime benefit limits have been abolished. Dependent does not have to be a student and can even be married. They cannot be eligible for another employer plan (via work or spouse). For grandfathered group plans, this applies only to dependents that do not have another source of employer-sponsored coverage (until 2014). Small businesses that develop wellness initiatives will be eligible for grants for up to five years. New Plans since 2010 now cover preventive care at no cost. Will you be forced to carry insurance? If you do not have insurance through your employer, or individually, in 2014 you will be required to carry insurance, join a state insurance exchange, or a Medicare program. If you do not, fines will be imposed. The official White House statement says: You will have access to new insurance choices in the same insurance marketplace where all members of Congress will buy their insurance, receive tax credits to help you afford coverage if needed, and get protections from insurance company abuses like denying you coverage based on pre-existing conditions. THERE ARE A LOT OF CHOICES OUT THERE. Plans, Provider networks, I-exchange (like Covered California), Carrier off-exchange plans, and more. However, Provider networks are severely limited within the exchange, so it may not be your best choice. There will still be HMO’s, HSA (Health Savings Accounts), and EPO (exclusive provider network) plans in and outside the exchange. Carriers will also be offering additional enhanced plans, and networks outside the exchanges. We represent all choices and most major carriers, including the Covered California Exchange / Marketplace. YOUR MOST IMPORTANT STEP. Please call us before you APPLY or do anything with your current coverage. We can help advise you on your best course of action. Learn more about individual health insurance / get a health insurance quote online. Will you be forced to cover your employees? Small businesses (under 50 full time equivalents) are not required to pay for coverage for employees. What we know for sure is starting in 2015, the legislation requires employers with more than 50 full time equivalent employees to offer affordable coverage to their workers or face a tax of $2,000 per full-time worker. There are significant tax breaks available to companies under 50 employees to encourage coverage. See our article on Health Care Reform Tax Saving, and watch for more to come as we find out more. See more information on our Group Health Insurance page. 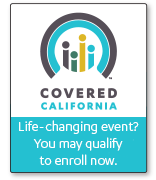 During open enrollment periods you can apply for any plan you choose, and be accepted. Also anytime you have a qualifying event, such as marriage, divorce, newborn, or loss of employer plan, you would also qualify at that time for guaranteed issue. At other times, carriers will be underwriting coverage, so beware and don’t cancel midterm, as you may lose your coverage for the rest of the year! From what we see right now, plan changes appear to be limited with underwriting or not even available mid year. You will likely have to wait for the next open enrollment. Open enrollment for Healthcare reform begins October 1st 2014 and ends March 31st 2014 (a one-time extension). Future Healthcare open enrollment will be October 15th and December 7th of each year. No matter when you sign up, all plans and changes go into effect on January 1st.